Cleveland, OH, USA; Cleveland Cavaliers guard Kyrie Irving (2) drives on Milwaukee Bucks center Epke Udoh (5) during the second half at Quicken Loans Arena. The Cavs beat the Bucks 114-111. CLEVELAND (AP) — Kyrie Irving pushed himself so hard he nearly vomited while sitting on the bench in the fourth quarter. A flu bug couldn’t stop him, and neither could the Bucks. Irving made four free throws in the final 21.5 seconds of overtime and finished with 39 points despite being sick, leading the Cleveland Cavaliers to a 114-111 win over short-handed Milwaukee on Friday night. Irving spent the previous two days at home on the couch, trying to shake off an illness that flattened him. He missed practice on Thursday and almost sat out the game before deciding to leave his house about two hours before tip-off. The All-Star guard wound up playing 43 minutes and added six assists and four blocks while carrying the Cavs to their fifth win in six home games. "I’m tired," Irving said afterward. "I really just want to lay down right now." Earl Clark made a 3-pointer as the shot clock expired with 44 seconds left in OT, and Jarrett Jack added 17 points for Cleveland. Tristan Thompson had 15 rebounds for the Cavs, who were grateful Irving chose to play. "I wish he was sick more often," Jack joked. With Milwaukee down by three, O.J. Mayo missed two 3-pointers in the last 10 seconds that would have tied it. "I’ll take them any time," Mayo said. "On the second one, I didn’t know I had that much time left. I kind of rushed it, but I should have made it." Mayo had 20 points, John Henson 18 and Brandon Knight added 17 and a career-high 14 rebounds as the banged-up Bucks lost their fifth straight. It was the second straight tough defeat for Milwaukee, which lost in double-overtime to New York on Wednesday. Before the game, Irving said he spent the previous two days "in the same spot at home" as he tried to get well. "I just got to get through it," he said. "I’m just going to give it my all and live with the results." They turned out fine as he willed himself and his team past the Bucks, who came in with the NBA’s worst record and were missing several key players because of injuries. However, Milwaukee was more than game and overcame an eight-point deficit in the fourth quarter. "I was going to stay home," Irving said. "But a goal of mine this season is to play in all 82 games. That’s always on the back of my mind. I just wanted to come out here and give what I could." But Middleton hit a 3-pointer, and after Irving made two free throws with 21.5 left, Mayo, back in the lineup after missing Wednesday’s game for a family funeral, buried a 3 to pull the Bucks within 112-111. "He’s a great player," Knight said of Irving. "He’s been doing his thing since he came into the NBA. He’s always going to make plays." 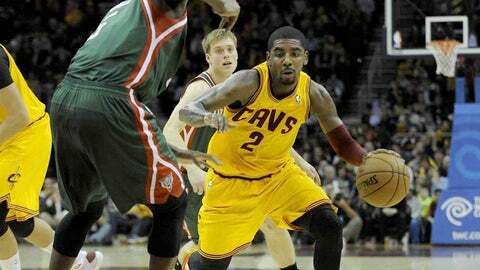 Although undermanned, the Bucks gave the Cavs all they could handle. "We’re a team that’s really banged up and very depleted," Bucks coach Larry Drew said. "I’m proud of our guys that they’ve competed and played hard. But we’re not going to be satisfied until we get over that hump." The Cavs, too, were not at full strength as guard Dion Waiters sat out with a sore wrist and rookie Anthony Bennett, the No. 1 overall pick in this year’s draft, had the flu. NOTES: Bucks rookie Giannis Antetokounmpo made his second career start. He got his first earlier this week against New York, becoming the youngest player (19 years, 12 days) to start an NBA game since Andrew Bynum (19, 4 days) started for the Lakers in 2006. Cavs coach Mike Brown became familiar with Antetokounmpo — he didn’t dare try to pronounce his name and applauded when a Milwaukee reporter nailed it — this summer at a camp in Las Vegas. "He looked like he was going to be a special talent then," Brown said. "You see the potential. He’s got a lot of intelligence and a great feel for the game."